Tired of Trying to Make Histograms in Excel? Does the Excel Data Analysis Toolpak take too long and require too many steps? 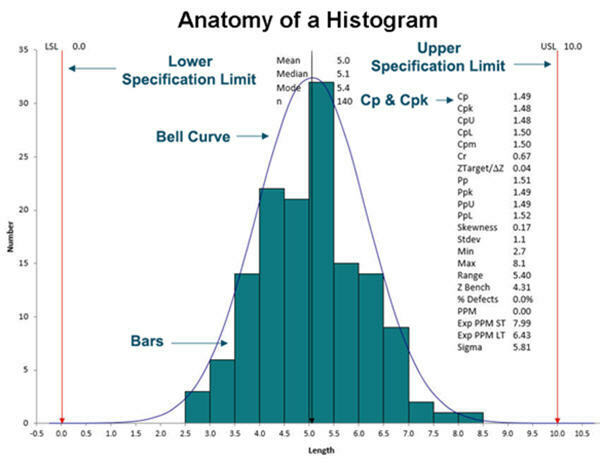 Is it difficult to show specification limits or the normal curve on your Excel histogram? Is it too hard to calculate process capability metrics Cp Cpk? Defect rates? Sigma? Analyze and Improve – ChartSmartXL will prompt you for spec limits, do the histogram calculations and draw the histogram with a curve for you. Histograms show the spread, or dispersion, of variable data. The customer's upper specification (USL) and lower specification limits (LSL) determine how well the process delivers on customer requirements. Measurements outside of the spec limits represent data points that don't meet customer requirements. What is Cool about the ChartSmartXL Histogram in Excel? Calculates more than 20 process capability analysis metrics including Cp Cpk and Pp Ppk. Histogram calculations can be viewed in the Excel worksheet created by ChartSmartXL. Allows you to experiment with how spec limits impact Cp Cpk by changing them in the histogram calculations worksheet. Allows you to adjust histogram bin intervals and the approximate number of bars. I am very impressed with ChartSmartXL. I work with Excel eight hours a day and thought that I had written macros that made me efficient. The Performance Charting and Histogram macros in ChartSmartXL alone have saved me hours of work and allowed me to present data to management in a format that is meaningful.